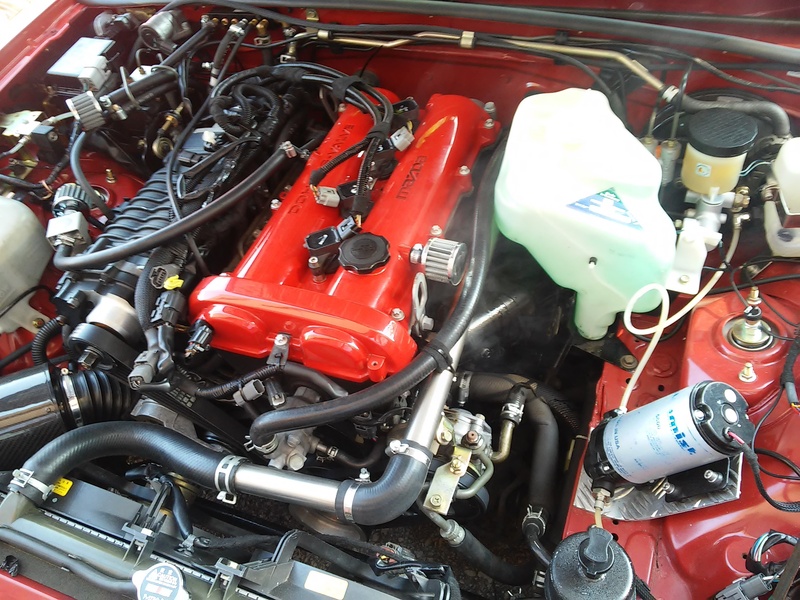 mp62 coldside oil in throttle body - Miata Turbo Forum - Boost cars, acquire cats. I have got NB 00 mp62 coldside supercharger setup and still have got problems with oil consumption through the throttle body. Throttle body is still very oily. 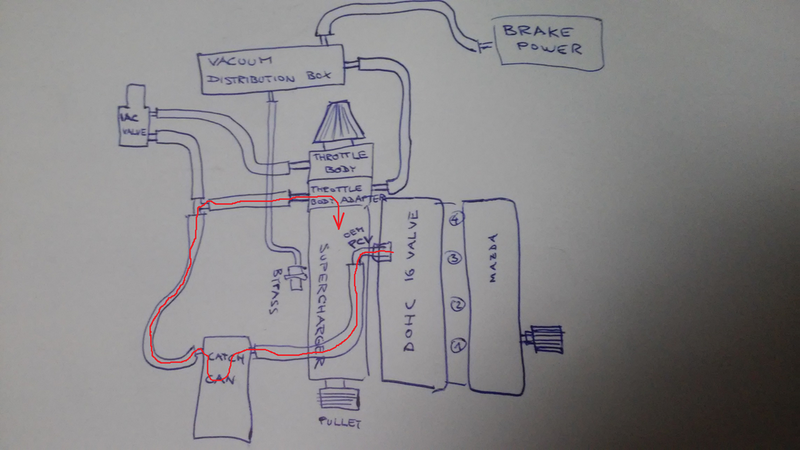 Is my vacuum line set up correct, or any problem with it? Or is it possible to delete pcv valve,and exchange it for little air filter ? Like on the other side of valve cover? This is where the oil is coming from. As long as it's configured how you have it, oil is going to go into the engine. To stop the oil, unhook the PCV. To reduce how much oil goes in, get a better catch can. On my setup I have the PCV blocked, and the breather (exhaust side vent) going to the air intake pre-sc. Thank you very much. 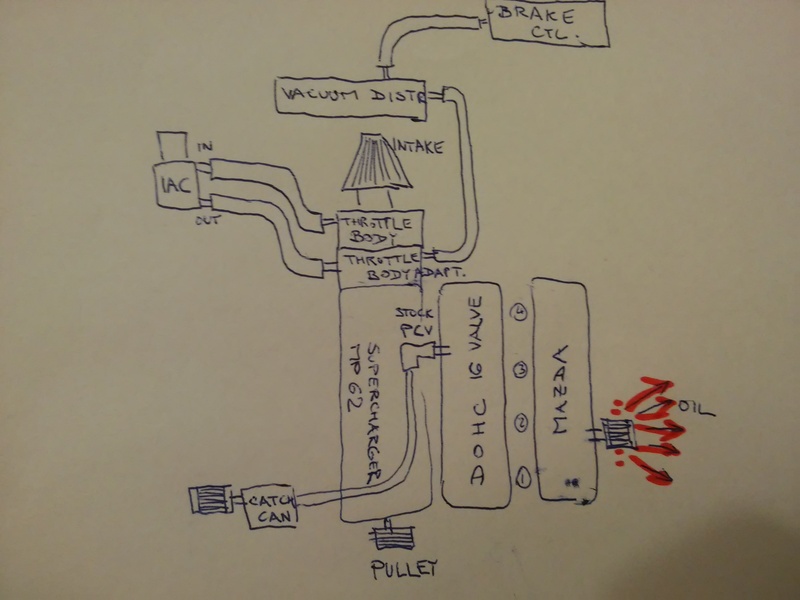 And could I block PCV valve, disconnect IAC valve input from throttle body - install mini air filter to the IAC valve input and connect output of IAC valve only directly to the throttle body adapter? Last edited by elektron; 06-23-2015 at 10:05 AM. Oil vapor will promote detonation, as well. It is good to eliminate it. Just block off PCV completely, don't use it. No filter on it, just plug it. I'm not a fan of removing the PCV system. There are real world power gains to be had from running a properly set up PCV system. It promotes better piston ring seal. Is there any reason you can't just vent the LH side (in the sketch) of the catch can to air? 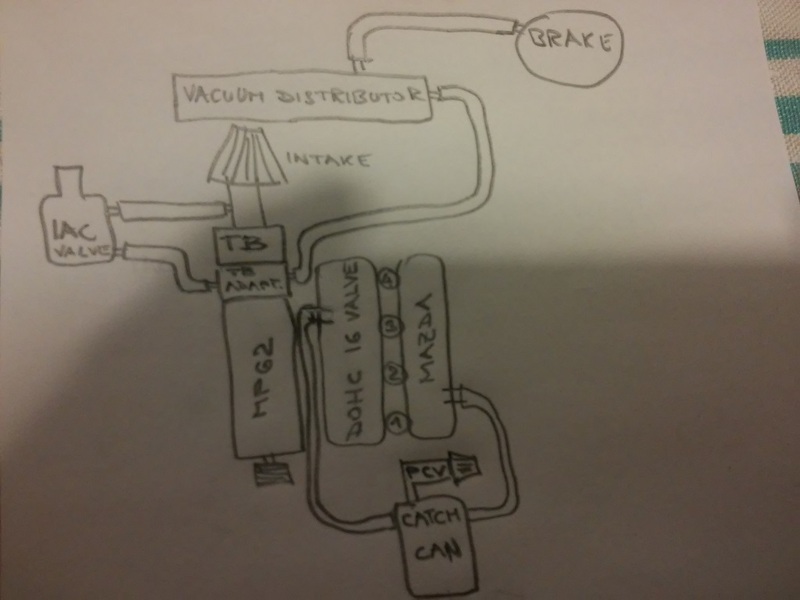 It would, as TNTUBA indicated, defeat the PCV system by depriving it of manifold vacuum. Hm. I thought the positive pressure in the crankcase would be enough to vent it. I have a vent-to-air catch can - no pcv valve, just a fitting - and there is... stuff... in the catch can. So it is at least working some of the time. The crankcase isn't going to explode from the pressure inside it, if that's what you mean. It'll vent out any excess pressure within it. There is, however, one school of thought which presupposes that the presence of an operating PCV system actually causes the crankcase to operate under slightly negative pressure, and that this is somehow beneficial to the longevity of the piston rings. Personally, I can't see the alleged mechanism of action here, but I acknowledge that it's a not-uncommon point of view. And all PCV systems have a 1-way valve in them that closes when you go WOT, shutting the system off. It's for emissions, and it operates when the motor is in vacuum only. The crankcase vent does vent crankcase pressure when at WOT. If you want to pull enough vacuum to improve ring seal, you need a pump designed for that installed on the engine. They exist, and they work. a PCV valve is not one of these pumps though. 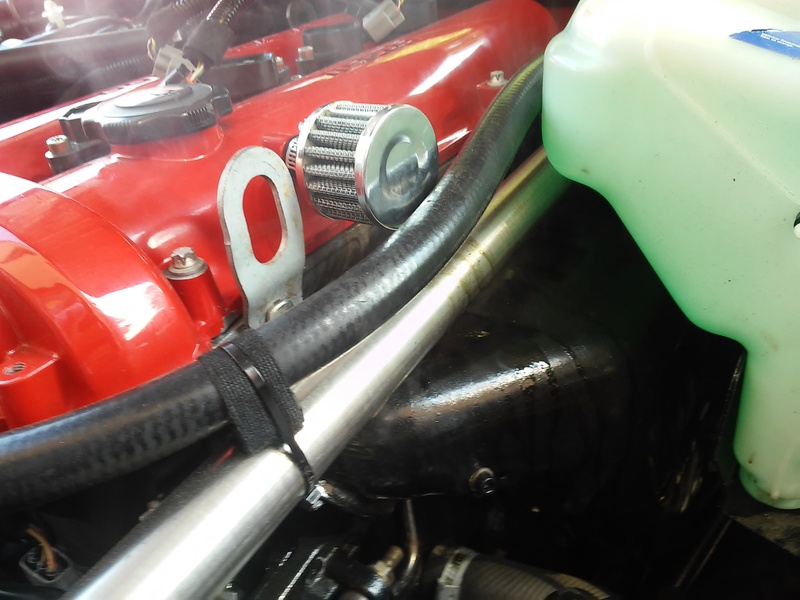 I just installed it this way - deleted vacuum line from catch can to throttle body. Today after 2-3 km test drive, it started to smoke from under the hood. Hotside crankcase filter started to spray oil. It seems that ventilation of crankcase without vacuum line helpfull of pcv side is not sufficient. Please any advise to eliminate it? I also measured cylinder pressure - 175-180-180-180psi. (8,6:1 CR pistons) , max. boost is 13 psi at redline. I have a 3/8" hose connected to the drivers side vent that goes to the intake upstream of the supercharger. This should be hooked up whether you have PCV working or not. So you have oil vapor induction? I wouldn't do that myself because oil vapor reduces the octane rating of the fuel/air mixture and promotes detonation, but if it works for you, great! Yes. Mine is a street car and I don't want the emissions/smell of it venting to atmosphere. If it were a race car though that's what I would do for the reason you state. On my engine the amount of oil coming out of that hose is about 1/10,000th the amount that comes out of the PCV valve, so I don't worry about it. I made it this way (passive), I have got no oil consumption, but have got problem with brakes. Especially when I need to brake immediately after throttled or after making donuts, brake pedal is hard for a moment. 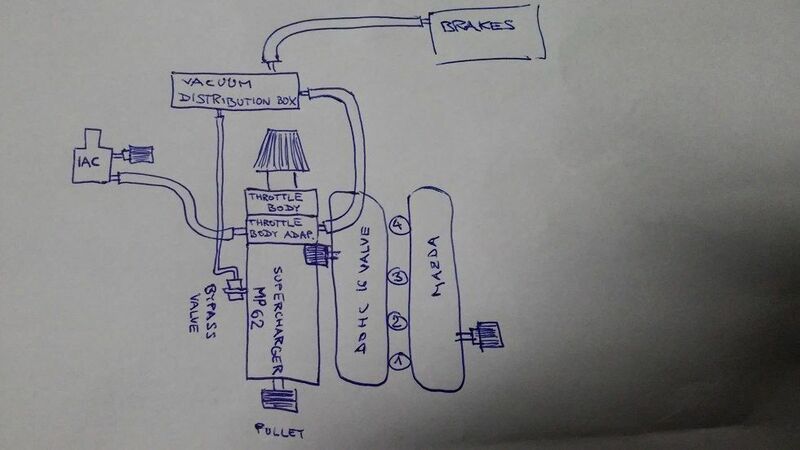 It seems that is is not enough vacuum for powering brakes. Last edited by elektron; 08-20-2015 at 05:01 PM. 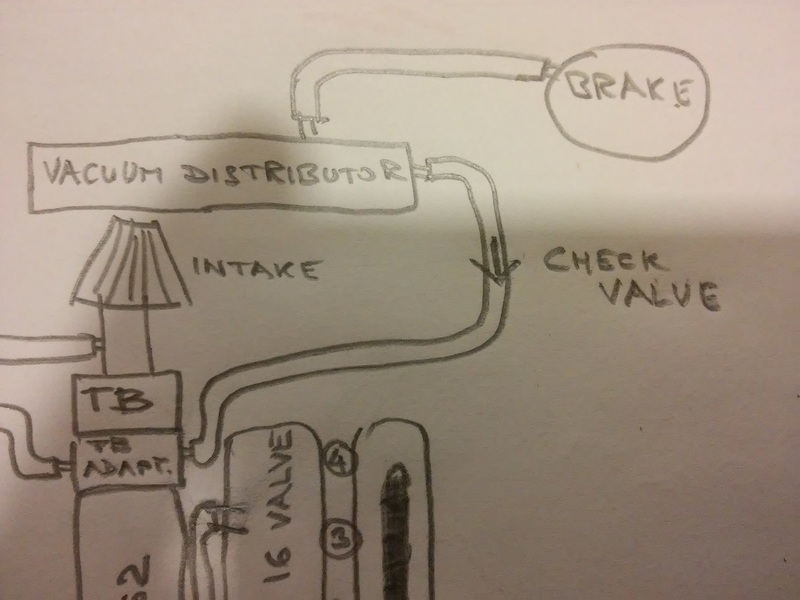 Is there a check-valve between the throttle body and the vacuum accumulator? No I havent got any. What type have you got? Something like this (direction)? Will it be helpful? Install a 1 way valve between the brake booster and the vacuum manifold. The factory hose that connects to the brake booster has a 1 way valve built into it a few inches away from the booster.